Weekend #1 - Competitive Season begins with a bang. 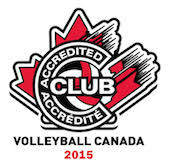 Beginning on Saturday the 15U Maverick Ambush and 16U Longhorns played exceptional volleyball with the Longhorns collecting their first medal this season with a tight three set win in the bronze medal match after a heartbreaking loss to Samurai from Montreal. On the girls side the Ambush decided they would "one up" the Longhorns with an undefeated performance and a gold medal at the 15U Level. Congratualtions to coaches Tanguay, St-Denis and Henrie and the girls for the first gold of the season. On Sunday the 17U Desperados arrived in Sherbrooke to play in the 18U division alongside those pesky 16U Longhorns. The Desperados quickly flexed their muscles and took care of their pool with a 5-1 record. A match up against the Longhorns in the semi was an unfortunate schedule quirk. The Longhorns on their second day and third consecutive match struggled in the first set but fought back to push their older counterparts to the limit in the second. In the end the Desperados prevailled not only in the semi but in s fun 3 set match in the final vs les Voyaguers d'Abitibi for a second Maverick Gold in two day. The OVA season begins in earnest this coming weekend and everyone is excited for more of the same.